We’ve already published our Huawei Ascend Mate review and as usual we made the device jump though our battery test hoops. The Ascend Mate is powered by a huge 4050 mAh Li-Ion battery and we expected nothing less than spectacular results. 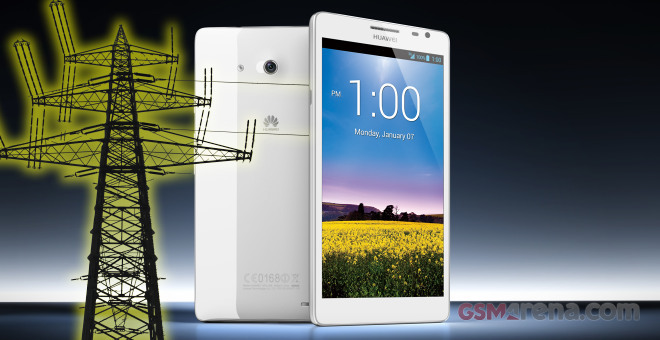 Huawei Ascend Mate is running on a quad-core chipset with a 1.5GHz Cortex A9 processor and a 16-core graphics. The screen is 6.1″ big, so we can safely say the Ascend Mate is a power-hungry device. As usual, our first test is 3G talk time. Thanks to the huge battery and the fact that the screen remains switched off for the duration of the test, the Ascend Mate overtook the RAZR MAXX and topped our chart with a score of over 25 hours. Given the ample screen we weren’t sure if the Huawei Ascend Mate will be able to repeat its impressive performance in the web browser test, but the smartphone did quite well there as well. It didn’t quite manage to come out on top so convincingly here, but it matched the Samsung’s Galaxy Mega 6.3 performance perfectly with 8 hours and 17 minutes. The video playback test brought another impressive result from the Huawei Ascend Mate. The phablet lasted for the impressive 12 hours 18 minutes, beating the Galaxy Mega 6.3 by almost 4 hours in the process. The Huawei promises great standby time for the Ascend Mate and with a battery so huge, the phablet had no problem delivering on that. 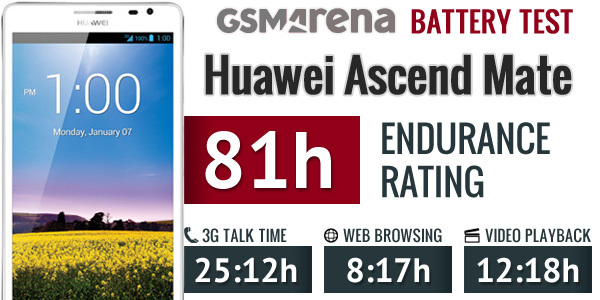 Adding the good stand-by endurance to the Huawei Ascend Mate’s excellent performance in the individual challenges gave us an overall endurance rating of 81 hours. The number means you’ll have to re-charge the Ascend Mate every 81 hours if you use the device for 1 hour of 3G talks, 1 hours of web browsing and 1 hour of video playback each day. That’s over three full days and Huawei certainly deserves a pat on the back for providing a device with this kind of power autonomy. It’s also worth mentioning that despite its huge battery, the Ascend Mate battery doesn’t take too long to charge. In fact it wasn’t any worse than most of the high-end smartphones today with the provided charger.